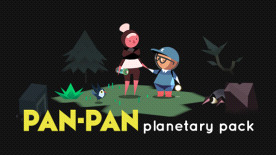 Pan-Pan: Planetary Pack brings the adventure titles of Might and Delight in collaboration with SPELKRAFT together. Also including Pid and the Pan-Pan soundtrack it invites you to explore a world lush with colour and punctuated by the tranquil sounds of a melodic soundtrack. • Set in an open world: Unlock new areas by collecting items and solving puzzles. • Stellar soundtrack created by acclaimed sound producer – Simon Wiklund. • A balanced blend of exploration and puzzle solving game mechanics. • Story beats told through environmental interactions. • Use a mix of tools, gadgets and devices to solve puzzles and uncover the path home.